Beau worked hard to change and strengthen child protection laws in Delaware. The Foundation will continue this work at home, in Delaware, and on a national level. The Foundation is committed to passing state laws and federal legislation that protect children and bring a voice to the voiceless. In this pursuit, we advocate on behalf of legislation, act as a convener and raise awareness of sexual assault. Beau was a different kind of leader who left a legacy of bravery in addressing challenging but critical topics. 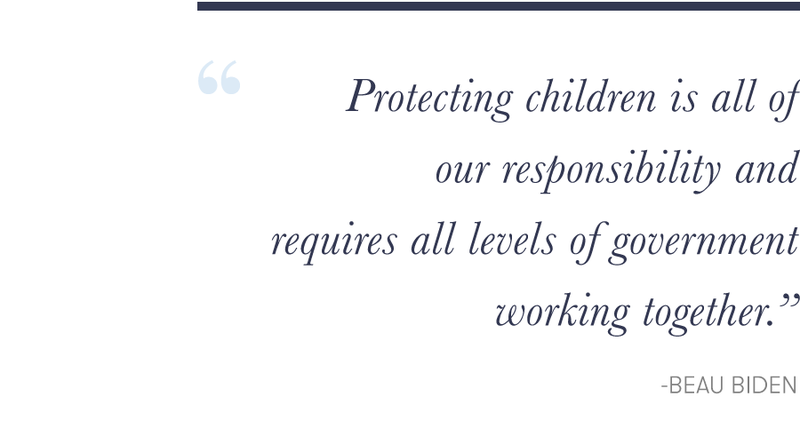 The Biden Family affirms its ongoing commitment to making all children free from the threat of sexual abuse. We will work closely with individuals and advocacy organizations in the pursuit of our mutual goals. Our vision is to ensure that legislators in state houses across America have clear templates for changing and strengthening their own laws. Where appropriate, the Foundation will mobilize grassroots supporters to share their thoughts with local legislators.